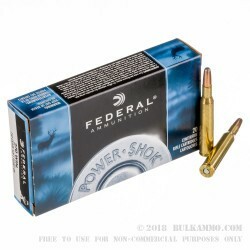 Federal Power-Shok ammunition is a great way to succeed on the hunt without spending an arm and a leg. 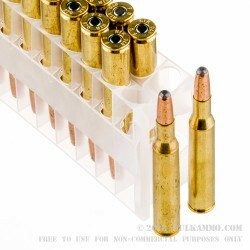 Each .270 Winchester cartridge in this box of 20 fires a 150 grain semi-jacketed soft point bullet at a muzzle velocity of 2,850 feet per second. 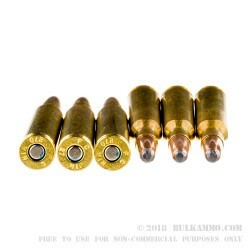 The high velocity is particularly important for soft-point ammunition, as it helps the projectile produce a wide, deadly mushroom upon contact with a target. A great choice for deer, coyotes, and other game! This ammo is loaded in Anoka, Minnesota by Federal Premium Ammunition. Like other Power-Shok loads, it uses non-corrosive Boxer primers and brass cases. Q: What is the drop/drift difference of the 130grain..as opposed to the 150 grain at 200 yards? Also,is the dropping power of 150 grain that beneficial for a deer? A: The 130gr 270 Win SP ammo drops 3" at 200 yards with a 100 yard zero. Assuming a perpendicular wind of 10mph, the same ammo will drift 3" at 200 yards. The 150gr 270 Win SPRN ammo drops 4" and has 5" of drift at 200 yards, again assuming a 100 yard zero for the drop calculation. 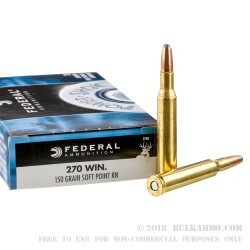 The 150gr bullet would be a better choice for elk, mule deer, moose, etc. The 130 would be a great choice for deer.